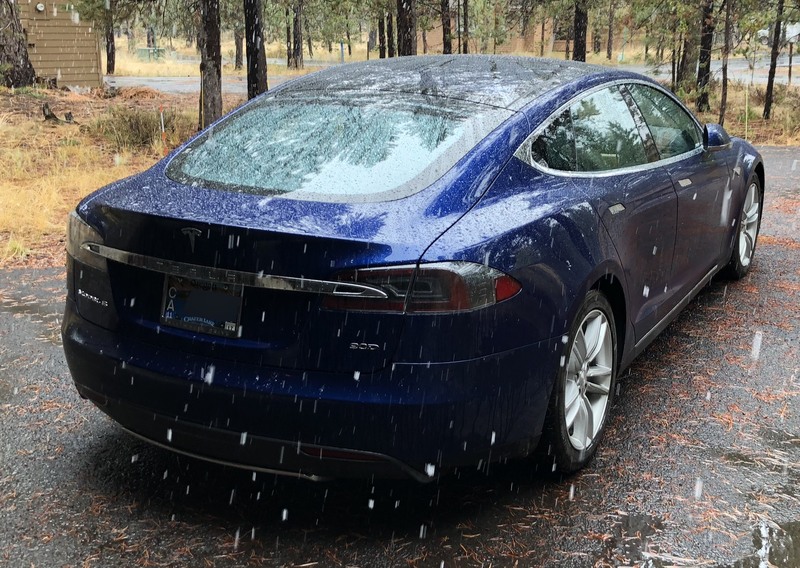 This is Part Two of a five-part series on our Tesla Model S. In Part One, I covered why we chose the Model S, the cost of the car, and a bit about Tesla the company. In today’s Part Two, I’ll discuss some of the things I love about the car; Part Three will have more of the loves, as well as the not-so-loves. Part Four will discuss what it’s like living with an electric car, and my thoughts on the future of auto electrification. Finally, Part Five will provide an unexpected ending (of sorts) to the series. Everything. OK, that’s not true. But there is a huge list of stuff that—even after nearly three years—helps make any drive in the Tesla an enjoyable experience. The list is generally ranked by order of importance to me, though a lot of these would be ties if I had to absolutely rank them. Most of these things are particular to Tesla’s cars (and some to the Model S in particular), though a couple are generally true of any electric vehicle. My car will reach 60mph in 4.2 seconds, which is pretty quick. But it’s the way it accelerates that is so addictive: The electric motors provide instant and continuous torque, and the Model S has only one forward gear. So when you press the go pedal, the car just goes. Whooosh, and you’re off. Where I really appreciate the torque and performance isn’t around the city (well, OK, it’s lots of fun to blast off from red traffic lights when you’re first in line), it’s out in rural areas, when you come across a very slow vehicle and want to pass. The torque and responsiveness take all the drama out of a passing maneuver—it takes a minimal amount of time and space to pass someone, which makes it safer for all involved. I mentioned this in Part One, but the handling is surprisingly good for a really large car—putting the battery pack close to the ground gives the Model S a very low center of gravity, which helps it stay level while cornering. You’ll never confuse its handling with that of a Miata, but it’s not annoying to drive on twisty roads, unlike our truck. This is simply Tesla’s name for radar cruise control, that is, a cruise control that can monitor the car’s distance from the vehicle in front, and adjust speed as necessary to maintain that distance. Many cars have this feature, though few feature full stop and start control, which is what makes it so nice in the Model S. Once enabled, the car can come to a complete stop, and then automatically start going again once traffic starts moving. I use traffic-aware cruise all the time, even in the city. Why? It’s the best way I’ve found to make sure I don’t start speeding—the Model S is so quiet that you can find yourself going much quicker than you thought you were. On longer drives, it’s a most-welcome assistant, especially on state highways that can be crowded and that route through the occasional speed trap small town: Instead of having to change my speed, assuming I’m following traffic, I just leave the cruise set at the highway limit. Then, as the traffic moves into a town and slows down, so does my car. 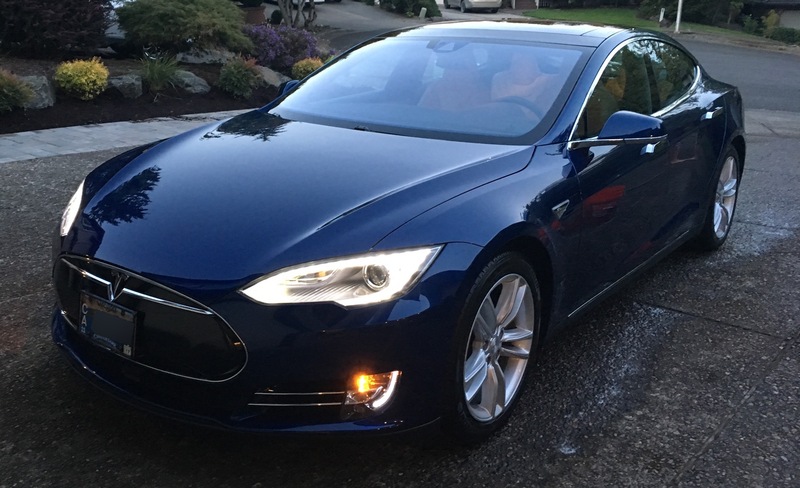 When we leave town and the limits pick up, the Model S accelerates back up to highway speeds. Autopilot is controlled by a stalk on the left side of the wheel—pull it towards you twice, and you activate Autopilot. (A single pull engages cruise control). 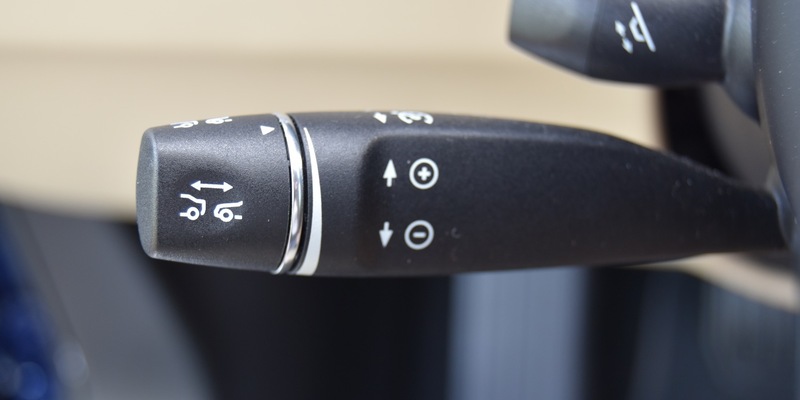 The dial at the end of the stalk sets the following distance for the cruise control system. If you understand Autopilot’s limitations and work within them, it’s an incredibly useful tool. Autopilot can be set for any speed (up to 90mph, I think) on a divided highway, and to the speed limit plus 5mph on non-divided highways and roadways. How do I use Autopilot? Basically never around town, though as noted, I do use the traffic-aware cruise in the city. But for road trips, or when driving into Portland from the suburbs at rush hour, I find Autopilot invaluable. On long freeway drives, it can take the tedium out of managing the car in moderate traffic that’s constantly changing speeds and weaving from lane to lane in search of a faster path. I enable Autopilot, and just stay in my lane. It speeds and slows as necessary, and tracks the freeway lanes with incredible accuracy. This leaves me free to watch the other drivers around me, trying to predict who is going to do something that makes me react in a hurry. On non-divided highways, I find Autopilot really reduces the stress level, as I don’t need to worry about the car wandering across the center line if I sneeze at the wrong time, or do something stupid like pouring my drink all over myself when I try to pick it up. And where Autopilot really excels is navigating heavy traffic; I call my new approach to such situations “zen and the art of Autopilot.” Instead of stressing out about the traffic, trying to find the fastest lane, and constantly looking for the next hole to take advantage of, I just enable Autopilot and stay in my lane. I don’t use Autopilot to read books, or to use my phone, or to do anything that takes my eyes away from the road for any length of time. I use it to reduce the stress level associated with driving in traffic and to reduce the boredom that comes with miles of dead-straight freeway roads. And in that role, it excels. As you approach the car, the doors unlock, the mirrors unfold, and the handles pop out. No need to find a key fob, touch something on the car, etc. Just get in and go. When you park and get out of the car, the process repeats: As you walk away, the car locks itself, the mirrors fold, and the door handles retract. 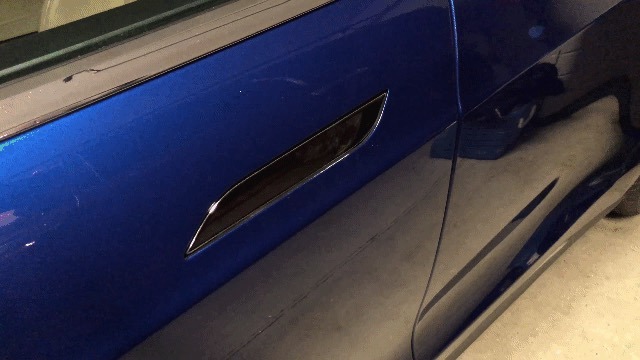 If you don’t like this behavior, you can disable the door handle magic (as well as the folding mirrors and auto-unlocking) in the car’s settings. Unlike a car with an internal combustion engine, there’s no warm-up time (or cool down time, as certain turbo engines may need). You just get in and go—there’s not even a stop/start button in the car: If you have your key fob (or have authorized keyless driving), you literally just get in, press the brake pedal to wake the car, then go. Combined with the previously-mentioned auto-unlocking doors, the drive-away experience is incredibly easy. And when you get to where you’re going, things are just as easy: There’s nothing to turn off, and you don’t even need to lock the car—as mentioned above, the car locks (and the mirrors fold and the door handles retract) once the car loses contact with your key. If you open the driver’s door without putting the car in Park after stopping, it will automatically change to Park. Like incredibly quiet. There’s a lot of sound deadening material in the Model S, because without a motor, you’d otherwise hear everything. And I must say, it works. Even at highway speeds, the car is amazingly quiet. I’ve driven the Model X, and the S is notably quieter—I think because there’s less interior volume in the S, and maybe less sound deadening material in the X to try to save some weight. My car gets regular software updates, just like my phone and computer. These updates can fix bugs, but can also add entirely new features. For example, they’ve added the ability to have driver profiles assigned to keys; a “chill mode” option for slower acceleration, automatic cabin overheat protection (to prevent the cabin from getting deathly hot); and many more. In addition, the nav system’s maps have been updated a couple of times, and nav itself has gained some new features. 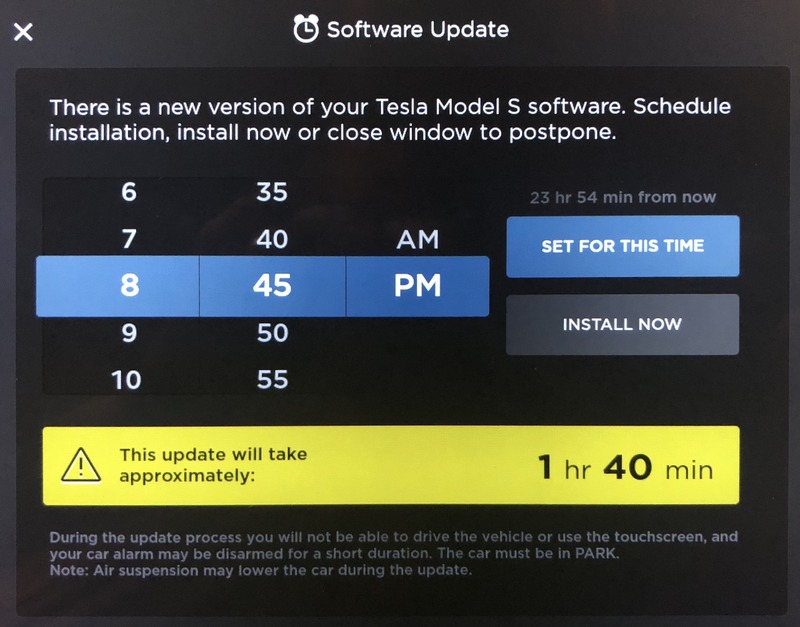 I’m informed when there’s an update available, and can schedule it at a time that works for me—typically overnight, or any time I won’t need the car for a couple of hours. After that, the updates “just happen.” And in my time with the car, I’ve never seen a software update fail. With a traditional car, any change to the software would require scheduling a service visit at the dealer, dropping the car off for a day (and arranging alternate transportation)…and probably paying for whatever new feature they’d decided to release. The downside to these changes, of course, is that sometimes you may get an update that takes away something you like, or changes the UI in a way that you don’t agree with. This has happened a couple of times, most notably with version 9 of the OS, which was not universally well liked by Model S owners. Many cars have parking distance sensors that beep, and perhaps display a light on a small picture of the car indicating where the obstacle is. 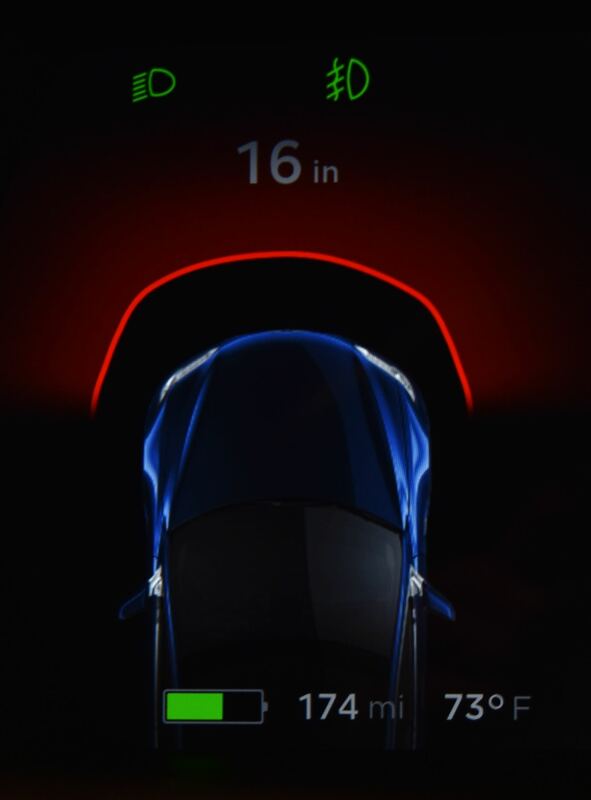 On the Tesla, the dash shows the distance in inches, and a graphic displays the relationship of the obstacles to the car. This makes it incredibly easy to park in tight spaces, such as my garage where the front end needs to come within a couple inches of some cabinetry. 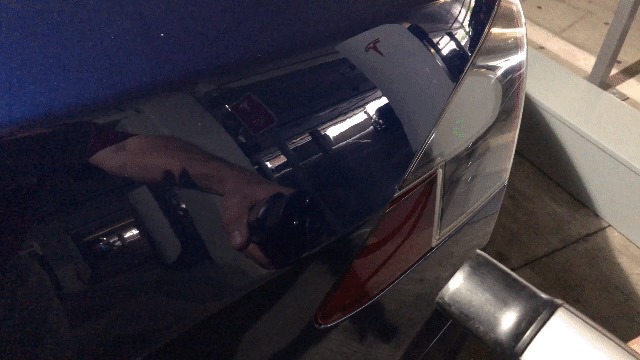 The charging port on the Model S is normally hidden. There’s no button on the port’s door, or obvious control inside the car to open the door. So how do you open it? Approach with the charge cord, press the “ready to connect” button on the charge cable, and the charge port’s door pops open. Remove the cord, and the door closes after a few seconds. 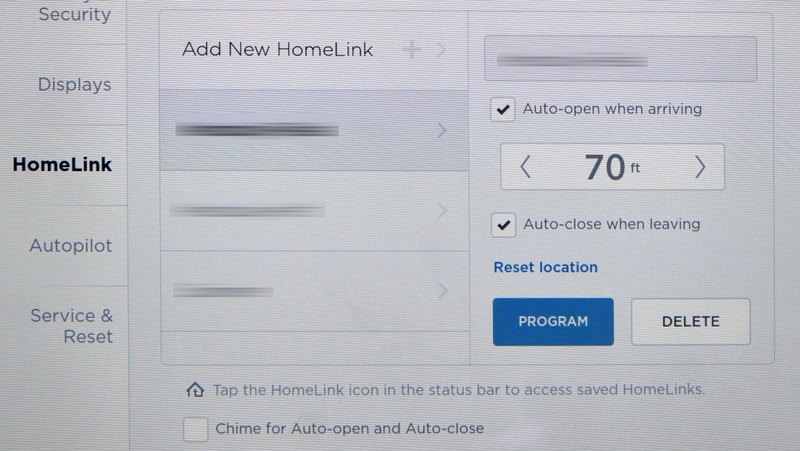 Many new cars come with HomeLink, which lets you program up to three buttons in the car to control stuff in your home, typically your garage door opener(s). 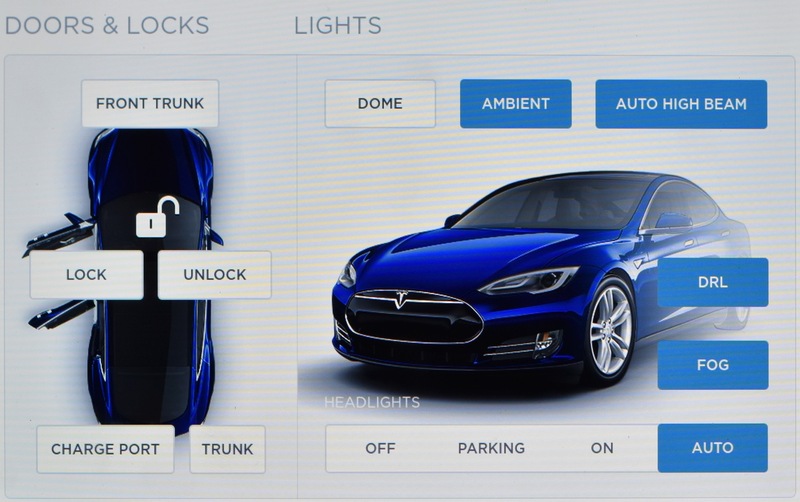 The Tesla has HomeLink, but it takes it one step further: You can optionally have the door automatically open when you arrive, and close when you leave. This works really well, and once I tried it, I wondered why other cars that have HomeLink and GPS don’t implement it. The answer, I think, is that the GPS may be provided by a third-party, as is HomeLink, and the car companies don’t do any work to integrate the two. Tesla has done that work, and it’s really convenient. I mentioned this in Part One, but I really love regenerative braking. It takes a bit of getting used to, because it is so aggressive (there’s a setting to reduce its effectiveness, if you prefer). But once you’re adjusted to regen braking, it means little to no brake wear. I imagine the brake pads on my car will last nearly forever, as I’m only using them to slow from very slow speeds to a full stop. (The Chevrolet Bolt can come to a full stop without touching the brakes; I’d love to see this added to the Model S at some point.) Other than that, though, I let the car slow itself down by just releasing the go pedal, and rarely touch the brake pedal. Dealing with wipers, lights, and high beams is no longer something I think about. The Model S has rain-sensing wipers, automatic headlights, and even brightness-sensing high beams that dim when a car approaches. I use the first two features all the time, but rarely the third—not because it doesn’t work, but because there’s seldom not a car approaching in our suburban/urban area, and there’s not much to be gained from using the high beams. These features aren’t unique to the Tesla; many cars have some or all of them. And once you’ve driven a car that has these things automated, it seems like such a waste of time to be messing with wipers and lights. The dash in the Model S consists of three areas: A center display with your speed and a depiction of the road and deteced traffic, and an area to each side of center. The non-center displays can be customized, and those settings are remembered for each driver profile (of which you can store 10 in the car). I’ve created three different driver profiles for myself, so I can easily switch between three different layouts, depending on my mood. The left and right areas can display GPS information, electricity consumption figures, media information, and more. If you prefer a minimalist look, you can even disable the panels entirely, leaving just the essentials—the car’s speed and a display of how the car sees the road and traffic around you. Of course, I was parked in the garage at the time that photo was taken, so the speed was zero, and there was (thankfully) no traffic around me. Customization of the dash is done through steering-wheel mounted control wheel/buttons, one on each side of the wheel. Press and hold one in, and a menu pops up letting you select which data you’d like to see. You can also use these wheel/buttons (and the surrounding buttons) to skip songs, control audio volume, and issue voice commands to the car. A quick aside: Tesla has never supported Apple Car Play or Android Auto, and probably never will. You can play music from your phone via Bluetooth, or via a plugged-in USB stick. I use a program called TeslaTunes to convert my iTunes library to a Tesla-usable format, written to a USB stick.